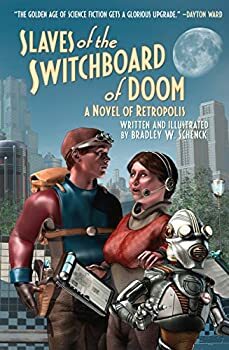 Slaves of the Switchboard of Doom (2017) is a sleek and shiny illustrated novel from Bradley W. Schenck, one that pays homage to the much-venerated Golden Age of science fiction while slipping a fair amount of modern social commentary beneath the chromed and bubble-helmeted exterior, and imparting the lesson that a well-equipped backpack will get you through most situations. Also, slide rules are important. Get yourself one if you don’t have one already, and if you do have one, maybe get a backup. Apparently, you never know when it’ll come in handy. Imagine if, whenever you wanted to look at a website on your computer or hand-held device, an actual person had to move a cable from one switchboard-port to another, as had to be done for telephone calls in the first half of the twentieth century. Keeping a steady flow of information available to users would require an enormous and skilled workforce — so when a group of operators, including their supervisor, are suddenly laid off, they’d dearly like to know why. Meanwhile, massive amounts of a lighter-than-air building material are being bought up with no explanation or immediately obvious purchaser. And a mute robot discovers something strange in a mysteriously darkened alleyway, bringing a dark secret to the attention of both the owner of a robot-manufacturing company and the president of the Fraternal League of Robotic Persons. Kelvin “Dash” Kent is hired by the former switchboard operators, inspired by Nola Gardner, to track down why their positions became abruptly obsolete. Dash would seem to be the hero of this tale — after all, he’s a freelance adventurer with a rocket parked atop his apartment building — but there’s a much larger story being told as Schenck subverts tropes freely and often, and the person you might expect to save the day actually ends being only one of many contributing factors among the sprawling ensemble cast. Nola has a good head on her shoulders, and it’s her ingenuity and decisiveness which brings a large number of Slaves of the Switchboard of Doom’s plot points together. Rusty the robot, though seemingly incapable of speech, makes important discoveries and actively drives his own sub-plot in surprising ways which, I hope, pave the way for future Retropolis stories. There are, of course, the inevitable comparisons to pop-culture staples like Fritz Lang’s groundbreaking film, Metropolis; Matt Groening and David X. Cohen’s beloved television series, Futurama; and the Golden Age sci-fi novels which, themselves, influenced so much of what Americans have envisioned for decades when they think of science fiction. Sharp-eyed readers are sure to spot plenty of other references in the various illustrations, like the film This Island Earth; there are many others, too many to list, and each reader is sure to spot something that another reader might pass over. But there’s plenty within Slaves of the Switchboard of Doom that is playfully unique to Schenck, and even if there isn’t much in the way of mystery regarding what’s at stake and what the Big Bad’s ultimate purpose is, the road to the resolution is interesting, and some of the ensemble’s secondary characters like Officer Maria da Cunha, Mr. Albert King (the aforementioned president of the League), and frustrated would-be novelist Edward J. Bellin, are a lot of fun. Schenck’s illustrations are spread throughout the novel, and his work on the robots is top-notch; each one stands out as unique, with its own features and personality, and a fluidity that fully incorporates them into their settings. When various types of robots are featured in the same illustration, it’s obvious what sort of work they might each have been built for — heavy lifting, guard duty, surgery, etc. Schenck’s humans are much more solid (one might even say static), and the sometimes disparate use of shading and bodily postures means that they often seem dropped onto a scene rather than fully integrated within it. However, I appreciate his portrayal of Retropolis as a diverse society, and neither the human nor robotic female characters are unpleasantly or overtly sexualized. Slaves of the Switchboard of Doom is an enjoyable read, and Schenck does a great job of replicating the retro-futuristic sensibility while including some modern touches, particularly with the inclusion of proactive female and POC characters, and his commentary on the benefits of social mobility. The plot drags a little, and some minor characters don’t carry their weight as well as I would have hoped, but the overall effort is fun. If you or someone you know is feeling nostalgic for a future that never was, Slaves of the Switchboard of Doom isn’t quite the same as a personal jet pack or rocketship, but it might scratch a little of that itch. Publication date: June 13, 2017. ROCKETS. ROBOTS. DEATH RAYS. MAD SCIENCE. THE FUTURE THAT NEVER WAS IS BACK. If Fritz Lang’s Metropolis somehow mated with Futurama, their mutant offspring might well be Slaves of the Switchboard of Doom. Inspired by the future imagined in the 1939 World Fair, this hilarious, beautifully illustrated adventure by writer and artist Bradley W. Schenck is utterly unlike anything else in science fiction: a gonzo, totally bonkers, gut-busting look at the World of Tomorrow, populated with dashing, bubble-helmeted heroes, faithful robot sidekicks, mad scientists, plucky rocket engineers, sassy switchboard operators, space pirates, and much, much more—enhanced throughout by two dozen astonishing illustrations. After a surprise efficiency review, the switchboard operators of Retropolis are replaced by a mysterious system beyond their comprehension. Dash Kent, freelance adventurer and apartment manager, is hired to get to the bottom of it, and discovers that the replacement switchboard is only one element of a plan concocted by an insane civil engineer: a plan so vast that it reaches from Retropolis to the Moon. And no one—not the Space Patrol, nor the Fraternal League of Robotic Persons, nor the mad scientists of Experimental Research District, nor even the priests of the Temple of the Spider God, will know what hit them. I love the title of this book! It really caught eye! sound like a fun one!